Waiting for that special engagement ring? It’s nothing compared to the diamonds Smirnoff is giving away. 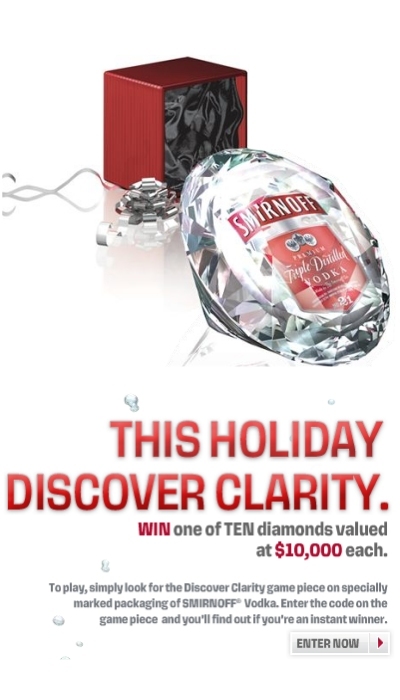 The premium vodka company will award ten lucky winners from their Discover Clarity sweepstakes diamonds valued at $10,000 each early next year. Enter the contest at Smirnoff.com by obtaining official entry codes found on specially marked neck-hangers of Smirnoff Vodka or log on to the website, follow the on-screen instructions and submit the entry code. Hurry, contest ends December 31, 2007!